The advent of the canal certainly put Cosgrove on the map, but paradoxically, in doing so it sowed the seeds of its later decline. By providing cheap transport, it helped to destroy the self-sufficiency of the village community, and this process was exacerbated by the coming of the railway and its workshops at Wolverton in the mid-nineteenth century. By 1891 the mill had ceased to grind corn. For nearly half a century Thomas Dawson had been the miller, and he was reputed never to have slept a single night away from Cosgrove. He was succeeded briefly by Thomas Amos who was the last miller. The living quarters of the mill became a tied cottage for Priory employees until the 1930s when much of the building was used to store farm produce. Around the turn of the century, the Brewery became a beer store rather than a beer producer and this must have meant the loss of jobs and a further exodus of men, seeking work elsewhere. The smithy survived until about 1920. At that date horses were still widely used on the farms, but their numbers were declining and, at the same time, horse drawn canal boats were giving way to diesel powered craft, so that the village blacksmith livelihood was very much under threat. Fortunately for him, his metalworking skills were in great demand for the railway works and he too joined the daily trek to Wolverton. The smithy was located near the Barley Mow, on what is now the pub car park, and after closure, it was used as a barn for the adjoining cottage, until both were demolished in the 1940s. The opening in 1878 of McCorquodale’s printing works at Wolverton was another noteworthy development. 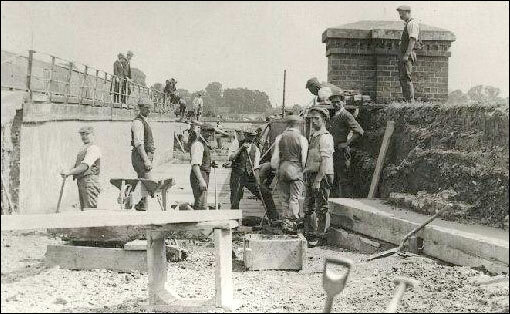 At first only 20 people were employed there, but great expansion in the 1890s meant a job with the girls as well as men, and by the early 1900s young women were joining the railway workers in the daily walk along the canal towpath. They obviously found this preferable to going into service -previously almost the only option open to them. Going into service at this time was not necessarily the demeaning experienced that some social historians seem to imply. With alternative employment becoming increasingly available, servants were at a premium, and were generally well treated, although they worked very long hours. Some girls worked at as Dailies at the Hall and the Priory, but some went as live in cooks or house maids to London where they were often better fed and housed than in their own, frequently overcrowded, homes. In the 1890s, a live in servant at the Priory was paid £3 per month, with a half day off each week, and the attractions of a boring, repetitive job at “the print” included better wages, shorter hours and every Sunday free. During much of the 19th century, the village boasted several shops, but by the early years of the 20th century, only the general store-come-post office remained. Until the 1890s, the post office seems to have been housed in the cottage that adjoined the Barley Mow, when Mrs. Marie Swannell was both postmistress and butcher. In the census returns, the post office is always named immediately after the pub (no street names or house numbers then) and certainly that cottage was twice as big as any other in the village - double fronted and with a very large back kitchen - ample room to have accommodated a shop. But by 1895, Mr. Fred Jelley was postmaster, baker and grocer, and his shop adjoined the bakehouse further down the main street. It would be interesting to know where the other early retail establishments had been located. 1892 marked the departure of the Rev. Patrick McDouall, who seems to have been the last of the old style country parsons in Cosgrove. A sale catalogue of that year gives an insight into the lifestyle at the Rectory in the late 19th century. It refers to the auction of the contents of the house and grounds. There were constructive changes in the village two, around the turn of the century. A Baptist Mission Hall was opened in the early 1900s and in 1912 the Council School was built. Staff and pupils were transferred there from the old National School and some of the first entries in the new schools’ log book are interesting. During the 1914 - 1918 war, 61 men were called up [actually they volunteered] into the armed forces (of whom 24 were killed). In their absence, the women coped with much of the farm work, but returned to the home as soon as peace came, and most of the married women did not again enter paid employment until World War II. Between 1870 and 1914, the slump in British agriculture caused farm rents to fall drastically, and this meant the rapid decline of the landed gentry. The Mansel family at the Hall seems to have owned most of the village during the greater part of the 19th century, but by the end of World War I their successor, the then Lord of the Manor, Mr. Grant-Thorold, was breaking up the estate and selling it off piecemeal. The pubs were purchased by Phipps, the Northampton brewers; the house opposite the church, known as the Cottage, was sold and renamed the Dower House; the land opposite the Hall gates were sold as a building plot for the erection of the Little Manor, and various parcels of land was sold to local farmers. So by about 1920, the old order had changed and the largely self-contained community of a hundred years earlier had disappeared. People went further afield, not only to work, but to shop, and the sadler, the cooper, the dressmaker and the shoemaker no longer figure in the village directory. The London and North Western Railway not only provided most of the jobs, it also, for more than a hundred years, provided the only fire brigade in the district. In Bill West’s book “The Railwaymen”, we read that “when cottages caught fire in at Cosgrove in 1900, the works brigade was informed by telegram. A brewer’s float drew the “manual” for part of the way; other firemen ran with the hose cart along the canal towpath”. The mind boggles! Did they get there in time? Were the cottages quite destroyed? Were they ever rebuilt? And where exactly in the village were they?